Chris Hadfield is one of the world's most seasoned and accomplished astronauts, and is the author of the #1 international bestseller, An Astronaut's Guide to Life on Earth and You Are Here: Around the World in 92 Minutes. The top graduate of the U.S. Air Force Test Pilot School in 1988 and U.S. Navy test pilot of the year in 1991, Hadfield was selected by the Canadian Space Agency to be an astronaut in 1992. He was CAPCOM for 25 Shuttle launches and served as Director of NASA Operations in Star City, Russia, Chief of Robotics for the NASA Astronaut Office in Houston, and Chief of International Space Station Operations. Hadfield most recently served as Commander of the International Space Station where, while conducting a record-setting number of scientific experiments and overseeing an emergency spacewalk, he gained worldwide acclaim for his breathtaking photographs and educational videos about life in space. His music video, a zero-gravity version of David Bowie's "Space Oddity," has received more than 30 million views online. His TED talk, delivered in March 2014, has been viewed almost four million times. This is his first picture book. Kate Fillion is a bestselling author and journalist who lives in Irvington, New York. Terry Fan received his formal art training at Ontario College of Art and Design in Toronto. His work is a blend of traditional and contemporary techniques, using ink or graphite mixed with digital. He spends his days (and nights) creating magical paintings, portraits and prints. Together with his brother Eric, he wrote and illustrated the critically-acclaimed picture book, The Night Gardener. Eric Fan is an artist and writer who lives in Toronto, Canada. He attended the Ontario College of Art and Design where he studied illustration, sculpture and film. He has a passion for vintage bikes, clockwork contraptions and impossible dreams. First things first: the book has a GLOW-IN-THE-DARK cover! And it is a fun to read message book. The message? Never give up on your dreams. You can achieve them if you work hard. The story? 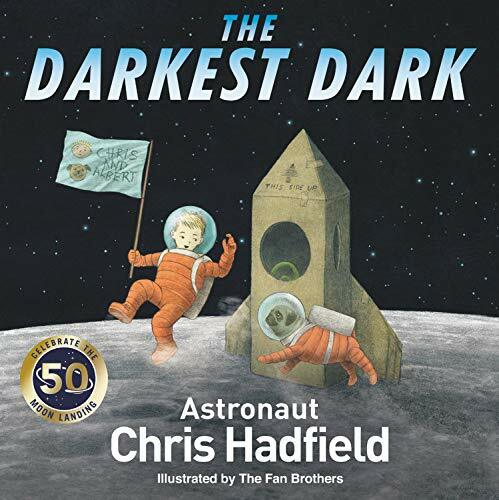 A young Canadian boy, Chris, has trouble going to sleep in his own bed because it is dark and, in the shadows, he imagines a bunch of aliens ready to jump out of the dark to frighten him. Finally, he is able to overcome his fear. How? He visits a neighbors home, with his family, and watches on the only television on the Island, the moon landing. He is changed. He realizes "the darkness of the universe is so much bigger and deeper than the darkness in his room . . . he wanted to explore every corner of the night sky. For the first time Chris could see the power and mystery and velvety black beauty of the dark." The illustrations are superb and match perfectly the feelings generated by the text. Get the book. Sit down with your kids and read it to them. Bob Lane is a retired philosophy prof and a reader (to his great grandkids who help with reviews of books like this one) of children's books.